Bartlesville is the seat of Washington County in northeast Oklahoma. The county is a north-south strip that is only about 10 miles wide and 40 miles long. The smallest county in the state, it lies along the eastern border of Osage County, the state’s largest. Named after George Washington, the county was formed at statehood in 1907 on land that had once been controlled by the Caddo, served as buffalo-hunting grounds for the Osage from 1760-1825, and then was part of the new Cherokee Nation after their forced relocation from Georgia. The first verified school in the county opened in 1874 at Silver Lake, one of the few natural lakes in Oklahoma, just south of modern-day Bartlesville, back when it was still Indian Territory. These days, the county is dominated by four school districts which serve 8,300 students. So how many one-room schools do you think operated in the county from 1874 through the closing of the last ones by the 1950s? That was the first of a series of trivia questions I posed earlier this month when I was asked to share some history of the rural schools with the Washington County Retired Educators Association. Their request was prompted by my presentation to them a year earlier on the history of the Bartlesville schools. School history can be a bit dull, even to an audience of retired educators! So my preparation including hunting for unusual things to highlight. The Bartlesville Area History Museum has a great book called Over a Century of Schools in Washington County: Gone But Not Forgotten. That was extremely helpful, but I also consulted the vertical files in the History Room at the Bartlesville Public Library. In 1912 a district saw its expensive school, which was less than two years old, burn up with the fire department forlornly looking on, unable to spray a drop of water on it. The two largest oil tank farms in the world once enabled two county districts to build four rather fine school buildings, only one of which is still standing a century later. One of those districts had a fellow build the first school buses in the state, but they were all horse-drawn. A tornado flattened one school in the 1930s while its two teachers and 70 schoolchildren sheltered in a ditch across the road. You can find much more information on Washington County at my long-standing history site of BartlesvilleHistory.org. The anchor for our trip was one of the shortest, yet most beautiful, hikes we will ever enjoy: a walk through the Upper Antelope Slot Canyon. 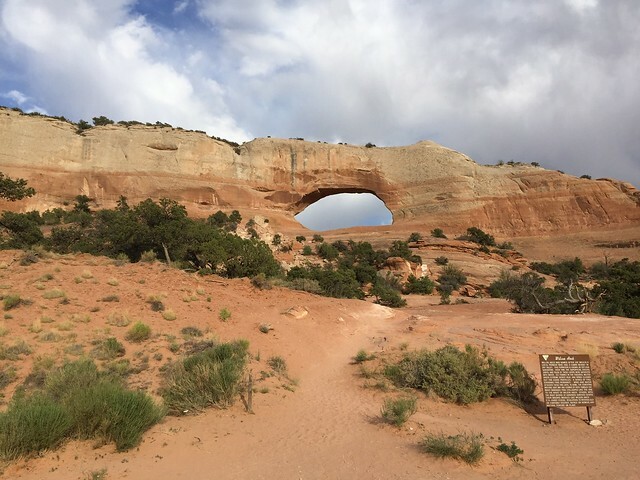 Its popularity and location in the Navajo reservation require one take a guided tour with a licensed operator. Months ahead of time I opted to book with the company founded by the late Ray Tsosie. I knew we would prefer a mid-day tour so that hopefully sun rays would penetrate into the narrow canyon for memorable photographs. At 10 a.m. we dutifully showed up at the tour store, a converted gas station in downtown Page. We checked in and waited to board one of the old pickups outfitted with passenger benches in its bed for the ride from downtown Page. 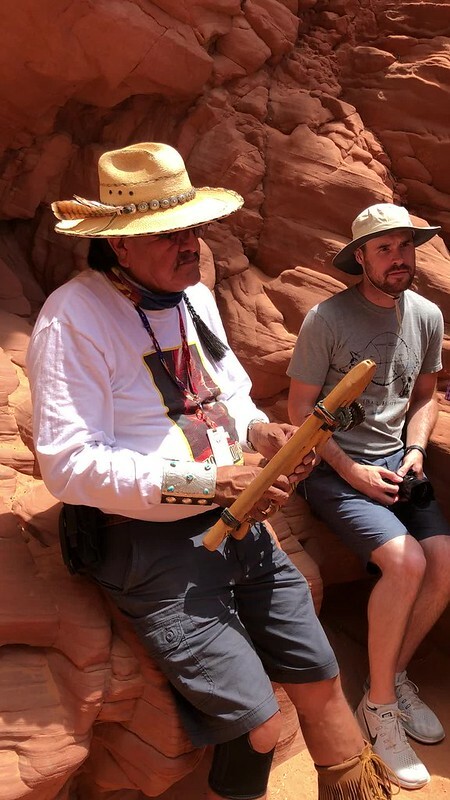 Our guide was Leonard Nez, a tall Navajo with a dry wit. He took our tickets as we boarded with a group of German tourists and told us to hang on. He meant it. We cruised the 4.5 miles to turn off Highway 98 at a wide and dry section of Antelope Creek’s bed. Then we had a very bouncy and fun three-mile ride along the sandy creek bed to where the creek cut a 500-foot long narrow slot the Navajo call Tsé bighánílíní, which means ‘the place where water runs through rocks’. When we pulled up at the entrance to the canyon, Leonard got out, and with black humor, silently pointed and counted his jolted passengers to see if anyone had fallen out along the way. 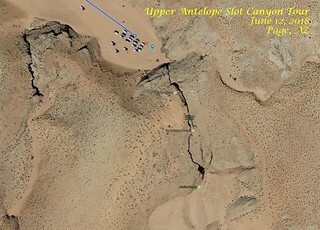 Rainwater, especially during monsoon season from mid-June to late September, collects in the Antelope Creek basin above the slot canyon sections. Its velocity and sand load increase as it rushes into the narrow slots, eroding passageways. 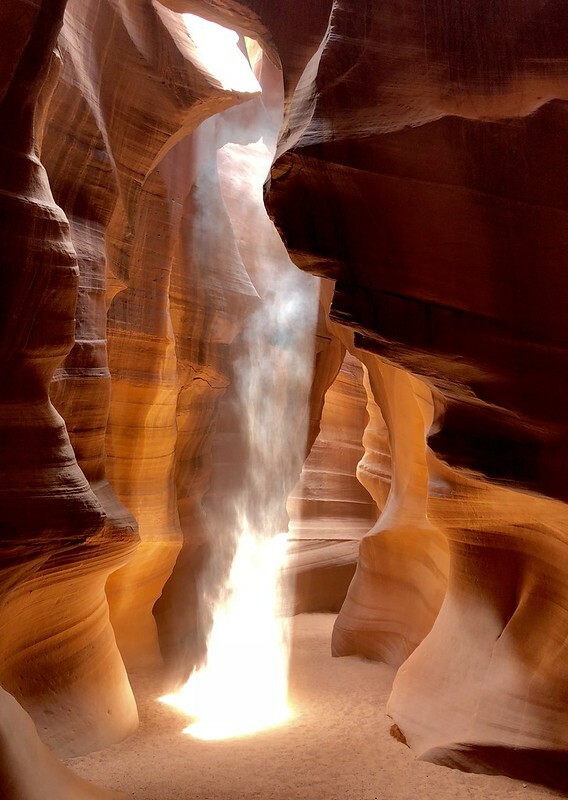 Another similar short section of canyon farther downstream, the Lower Antelope Slot Canyon, can also be toured. That part is longer than the Upper Canyon, and narrower in spots, with some uneven footing and has five flights of stairs, while the Upper Canyon is a smooth and level walk with more frequent sunbeams. Leonard ensured we had no packs. Some folks in the past spread cremation ashes in the canyon, requiring that it be closed so a medicine man could bless and cleanse it. Flash flooding also closes the canyon, of course, and a 36-hour flood in 2006 kept the Lower Canyon closed for months; 11 tourists died there in 1997. Our visit, however, was sunny and hot with no rain. It was a relief to enter the canyon’s shadows, with Leonard rapidly taking and setting each of our cameras for better shots. The beautiful smoothed sandstone walls rose high above our group, and Leonard began stopping and using a laser pointer to help us imagine bears, famous profiles and faces, and other animals from the undulating shapes and projections. We passed a tree limb that had been stranded high up on the walls for many years after it was deposited by a flood. Leonard enjoyed taking clever shots for us, such as the eye and the wave, and threw sand high into the air when we encountered a sunbeam, making its track through the air visible. Expertly herding us along, giving directions and guidance in various languages, Leonard led us through the sinuous passage. When needed, he redirected inconsiderate tourists who got lost in their own little world. The colors shifted with the angle of the rays and the width of the slot, until we reached the far end of the twisting passage. There we relaxed before reversing our path. As some oblivious Asian women chattered away, Leonard sat and played the triple flute for us, prompting a crow overhead to caw loudly. On the rapid return through the canyon to the truck, I took Leonard’s advice to silently and discreetly duck behind one of the photography tour groups so I could get a nice shot of one of the light shafts. Our group of Germans with a couple of Okies boarded the truck to bounce our happy way back to Page. This brief but memorable experience was Wendy’s favorite part of our trip. 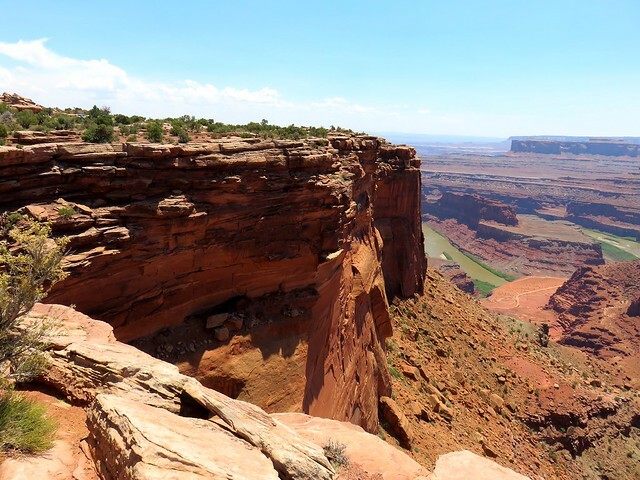 We returned to Gone West for lunch before heading out on a 4.5 hour 270 mile journey east and north to Moab, Utah where we would visit Dead Horse Point and drive along a beautiful stretch of the Colorado River. 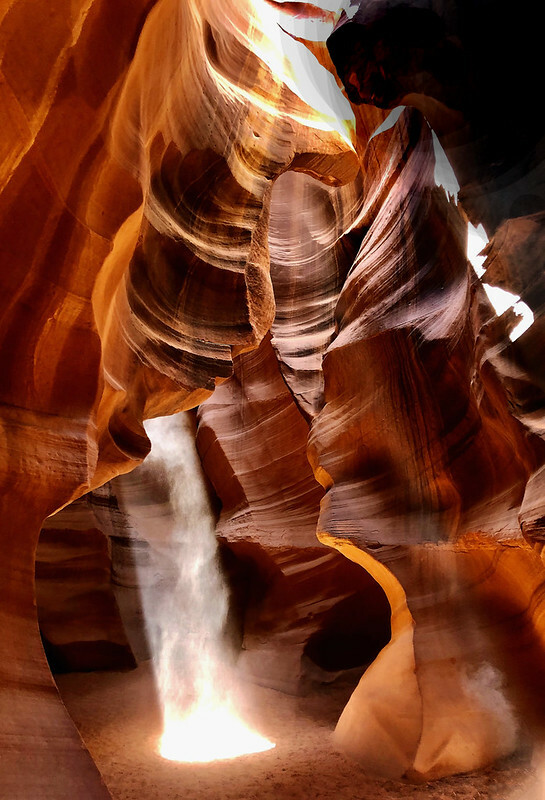 The highlight of our trip would come at the lowest point in our looping journey: a walk through the Antelope Slot Canyon near Page, Arizona. So we needed to make our way south out of Utah down to the Glen Canyon Dam which impounds Lake Powell. The terrain meant we would have to drive a long arc west, south, and then back east. Scenic Highway 12 continued to impress as we traveled west toward Bryce Canyon. A few small towns dot the arid Bryce valley. After we found that Foster’s Family Restaurant in Bryce was now the UpTop Steakhouse and only open in the evenings, we backtracked to Tropic for lunch at Rustler’s Restaurant. Tropic was named by pioneers seeking to promote it as a more temperate location than its competitors. In the late 1880s, the Mormon farmers in the area diverted water from the East Fork of the Sevier River into the often-dry Paria River drainage to irrigate their fields. They dug, mostly by hand, a 15-mile ditch which still runs today. We saw the Sevier River’s water flowing through the Tropic Ditch near the Mossy Cave Trail at the north end of Bryce Canyon. The surrounding hillsides had the characteristic look of the famous eroded amphitheaters of Bryce Canyon National Park a few miles to the southwest, which nature carved out of the pink Claron limestone of the Paunsaugunt Plateau. Unlike the Grand Canyon, Bryce was not carved by flowing water, but instead by frost-wedging and chemical weathering. For 200 days a year the temperature cycles above and below freezing in that area of Utah. During the day, melt water seeps into fractures only to freeze at night, expanding by 9%. The ice exerts a tremendous pressure of 2,000-20,000 pounds per square inch. Over time this “frost-wedging” shatters and pries rock apart. In addition, rain water, which is naturally acidic, slowly dissolves the limestone, rounding off edges and washing away debris. This creates fins of rock jutting out from the cliffsides, which then erode into free-standing hoodoos. 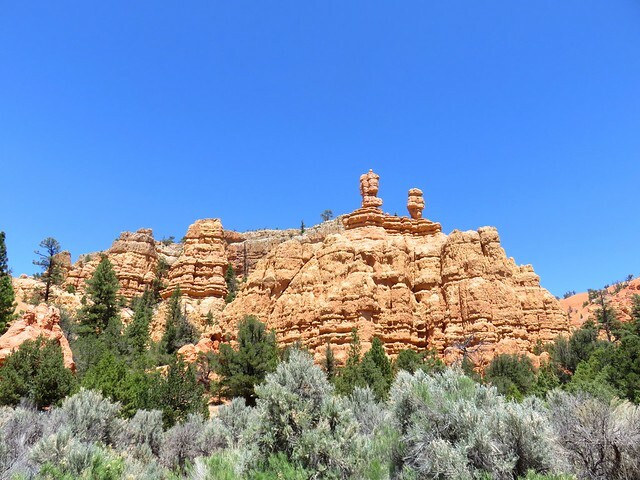 We shopped for trinkets in Bryce and then continued our journey west. 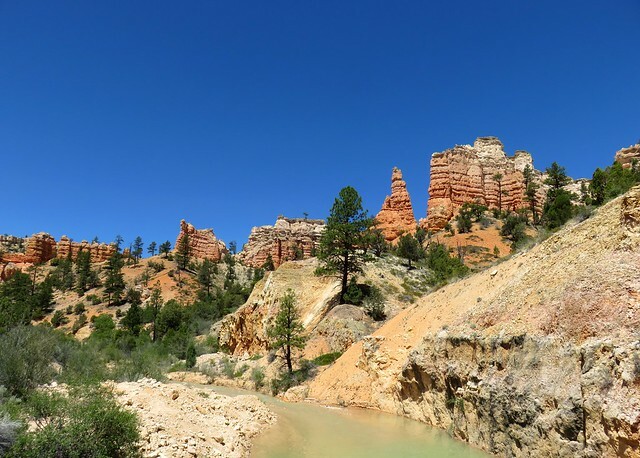 A dozen miles across the northern end of Bryce Canyon, Highway 12 runs through Red Canyon, the western edge of the valley, with its own erosion of the Claron limestone. The road passes through two manmade arches in the rock, which were fun to drive through. Too soon we left Highway 12, and the rest of the drive to Page was uneventful. We followed highway 89 down the Grand Staircase, a term Clarence Dutton coined for the steady descent, layer by layer, through the sedimentary rock formations from Bryce Canyon south to the Grand Canyon. The pink cliffs of Bryce give way to grey, then white, and eventually the Vermilion Cliffs we had driven by the previous summer, ending in the chocolate cliffs that form the top layer of the Grand Canyon. 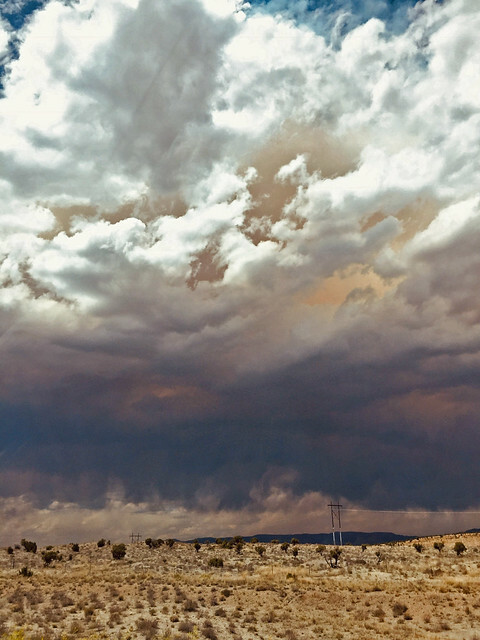 The high desert we drove through heading back east in far southern Utah towards Lake Powell was quite inhospitable. It became even more desolate as we dipped south into Arizona. 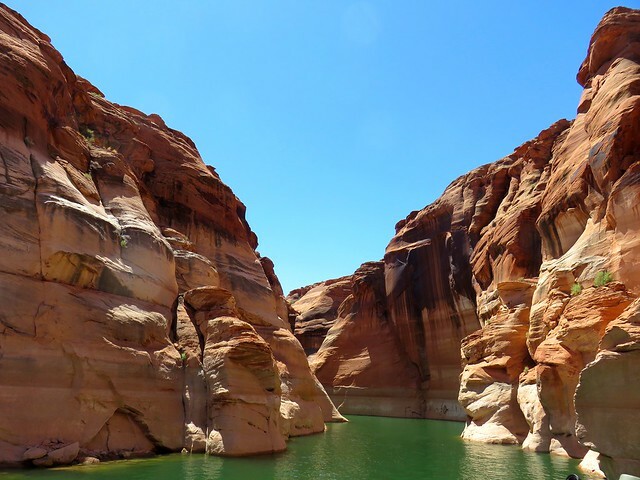 It would never occur to one to stop and stay in Page, Arizona were it not for the formidable Glen Canyon Dam and associated natural and man-made wonders. The 710-foot high dam was built by the U.S. Bureau of Reclamation from 1956 to 1966 and has always been controversial. Edward Abbey wanted to wreck it in The Monkey Wrench Gang, and Marc Reisner delineated its downsides in his superb history Cadillac Desert. 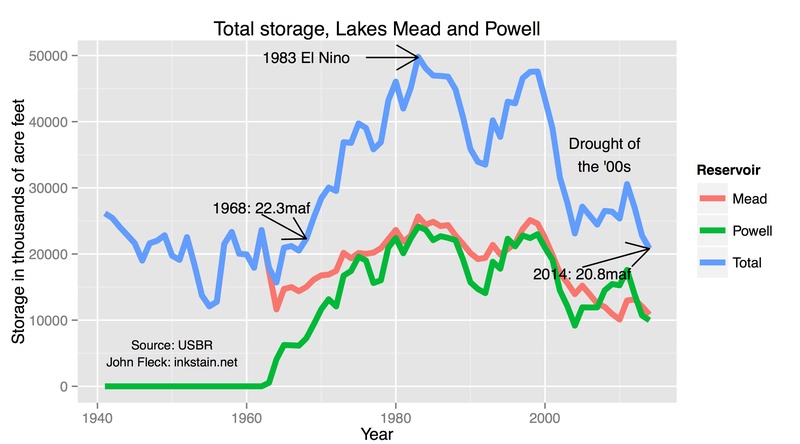 The level of Lake Powell fluctuates considerably, but it has never recovered from a drought in the first years of the 21st century. 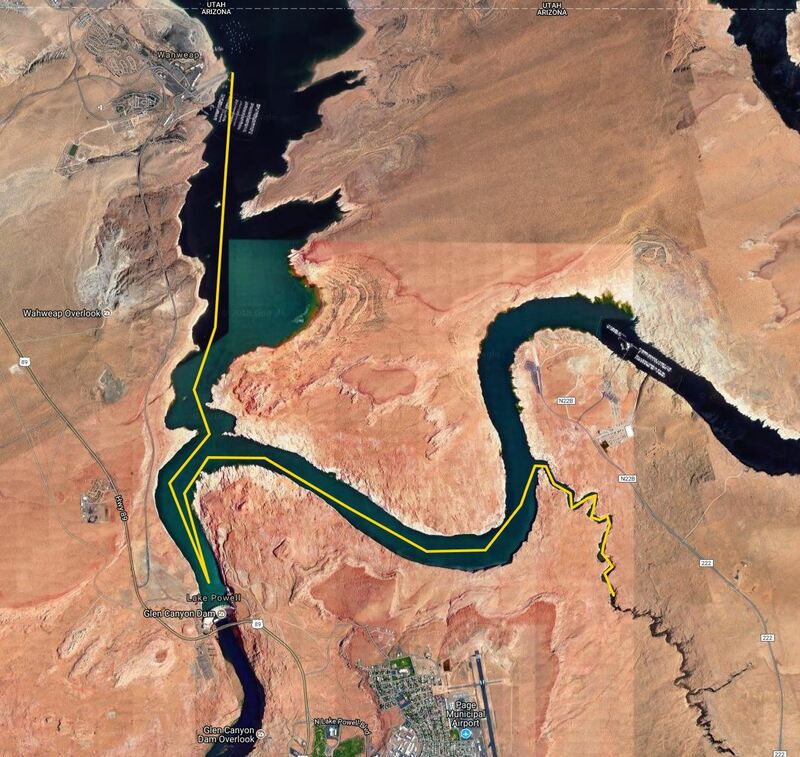 While its full capacity ranks it as the second-largest man-made reservoir in our country, global warming and the increasing demands on the Colorado River mean it could eventually become a “dead pool” that can no longer generate hydroelectric power. We were glad to arrive at the Days Inn in Page, where we had a nice dinner at the Gone West restaurant. The next morning we drove to the Wahweap Marina for an Antelope Canyon boat cruise. Wahweap is a Paiute word meaning “bitter water” and dates back to when the mineral-laden trickles of water in the area were unattractive. Now all that and much of Glen Canyon is subsumed under the cool clear waters of the lake. There was quite a crowd in the marina waiting to board the boat, hiding from the brutal sunlight outside. We sat on the upper deck by a retired couple from New Jersey. They were fun to visit with and in the middle of their own adventure out west with some other retirees. I wore my Tilley hat, of course, but made the mistake of wearing shorts and forgetting to protect my legs with sunscreen. The heat and sunlight were intense, leaving me with an itchy sunburn by the end of the 90-minute cruise. Our boat took us past the dam and Castle Rock. 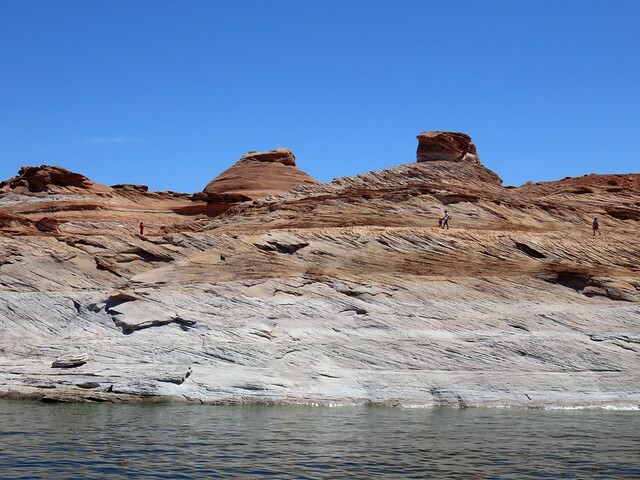 All around us were the red cliffs of the uppermost layers of Glen Canyon and the “bathtub ring” of mineral deposits from back when the lake was actually full decades ago. We zoomed by the cliffs and eventually headed up Antelope Canyon. Our massive vessel cruised up the winding canyon, following a much smaller boat. I was surprised at how far we could make it up the winding and narrowing canyon formed by Antelope Creek. Desert varnish stained the walls of the canyon, reminding me of the stains at Echo Amphitheater near Ghost Ranch in New Mexico. This natural patina is primarily clay particles with iron and manganese oxides. The weathering in some places exposed the layers of sedimentary rock, created hoodoos, and in spots yielded bright orange sand. There were quite a few houseboats on the lake, although for me the intense heat and sunlight, with little vegetation, left me with little desire to linger. We returned to the marina and struggled to cool off inside the resort before heading back to Page. That afternoon we laundered clothes, and I bought some aloe vera gel for my sunburned legs. 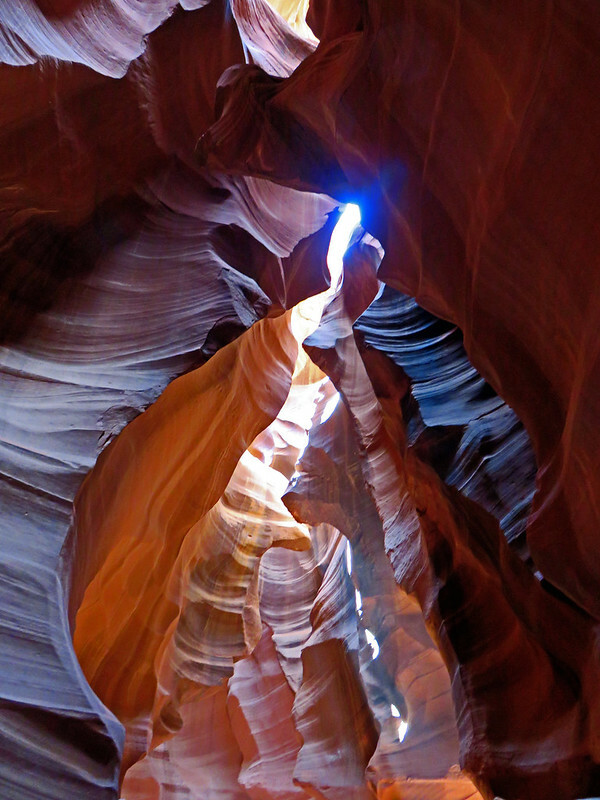 The next day we would revisit Antelope Canyon via a guided walking tour through its upper slot canyon. The Grand Staircase-Escalante National Monument is a rugged region of canyons, arches, plateaus and cliffs. Established in 1996, it was recently reduced and broken apart into three separate monuments. 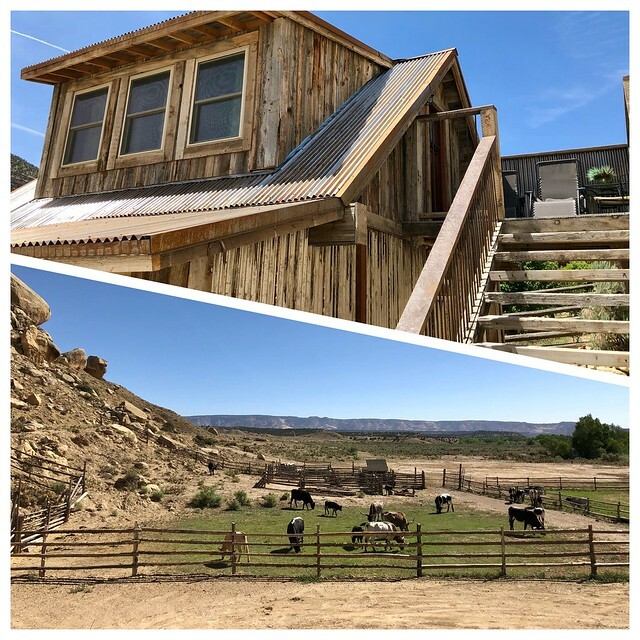 We visited the northeast part of the region, spending a day driving south from Salt Lake City to a casita west of the small town of Escalante. 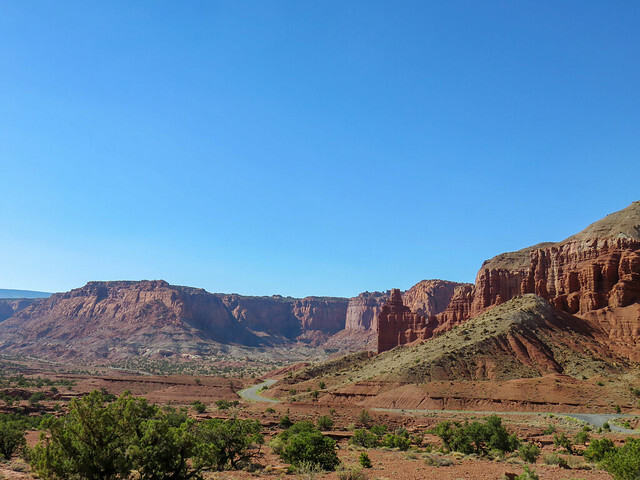 We stopped briefly along the way to visit the northern tip of Capitol Reef National Park and then enjoyed the amazing scenery along Highway 12 from there south and west to Escalante. A reef sounds rather out of place in this dry desert land, but locally it refers to a rocky barrier to land travel just as ocean reefs can bar travel on the sea. 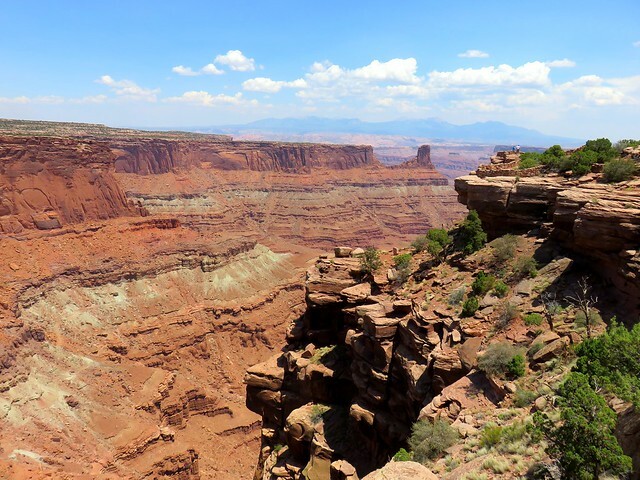 The national park is a thin strip of land running north-south which encompasses the Waterpocket Fold, a 100-mile long monocline which is an S-shaped warp in the rocks likely formed as continental plates collided to create the Rocky Mountains. Pools in the eroded rocks capture rainwater, and a colorful section near the Fremont River is called Capitol Reef because of white sandstone dome formations that resemble the domes placed upon many capitol buildings. 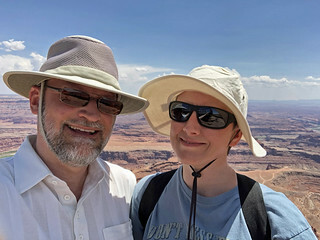 We didn’t have time to explore or hike in the park, but did drive over to its northern entrance to take in Panorama Point and the Goosenecks Overlook. Highway 24 runs along the base of the stacked red layers in the Mummy Cliffs. A side road took us to a parking area, with a short slickrock trail leading up a rise for the views. Slickrock is smooth, weathered sandstone which sheds water instantly and can be dangerous to hikers as well as horses wearing iron shoes, but is fine for bikes and jeeps. In this area, the sandstone was either slickrock or heavily pockmarked. Wendy patiently waited while I scampered about taking in the vistas atop the slabs and ridges of sandstone. Then we drove to the Goosenecks Overlook, where she shied away from the quite windy overlooks 800 feet above Sulphur Creek. Over the past six million years the creek has cut its winding way deep into the rock. Sulphur Creek has cut through the Moenkopi Formation of mud and sand from shallow seas and floodplains of 245 million years ago, on down through the Kaibab Limestone deposited in shallow seas 270 million years ago and which is the top layer of the Grand Canyon 160 miles to the south. The creek has further penetrated to the White Rim Sandstone formed from coastal sand dunes 280 million years ago. This carved layer cake of deposition is quite beautiful, but we were both drying out in the hot dessicating wind. 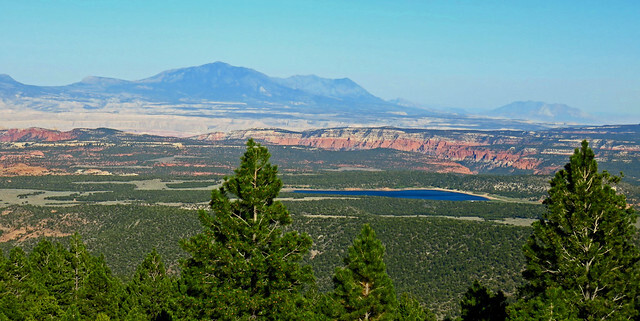 So we were glad to hop back into our Ford Fusion for the drive along Highway 12 towards Escalante. We found relief from the heat as we drove from the desert up into the forests of Boulder Mountain, climbing from 6,300 feet to over 9,000 feet through large stands of aspen, pine, spruce, and fir. The Larb Hollow Overlook provided a view of the Henry Mountains, the last mountain range to be added to the map of the United States back in 1872. 350 bison roam freely there, one of only three free-roaming and genetically purebred herds left on our public lands. We could see the Lower Bowns Reservoir in the distance as well as jutting rock formations. The road descended from the mountain to the town of Boulder, and then ran along the Hogback, a razorback ridge of slickrock high above Calf Creek to the west and Boulder Creek to the east. We stopped after that impressive if somewhat harrowing drive to view Calf Creek’s canyon. We crossed the Escalante River, taking a panorama from the south canyon wall, looking down upon a yurt perched on a ledge far below. Longhorn cattle, Holsteins, horses, and even a bighorn sheep grazed in the small pastures around the casita. At night Wendy would tuck herself in a space under one of the gables for her nightly coffee while reading the latest book by David Sedaris. By day I sat up in the bed or reclined out on the balcony to read Pride and Prejudice, my follow-up to reading Jane Austen’s Emma six summers back. It was disconcerting to look up from my book and be transported from a search for husbands for Mr. Bennet’s daughters in Regency England to a sunny Utah pasture. Our big outing from Escalante was an incredibly bumpy ride 12 miles along the washboard Hole in the Rock road to the Devil’s Garden. 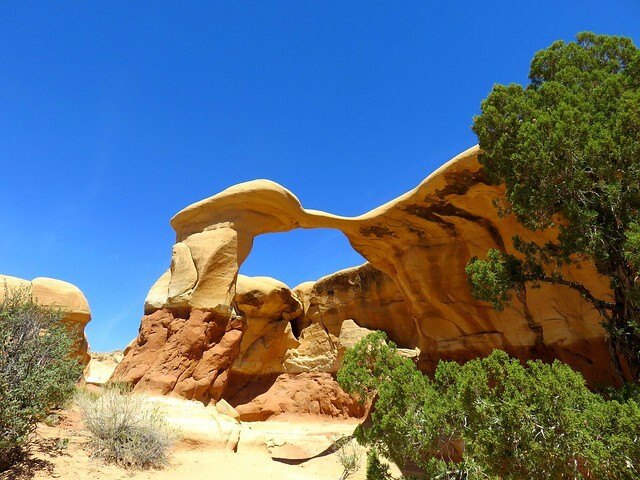 It is a collection of hoodoos and arches in the Entrada Sandstone. 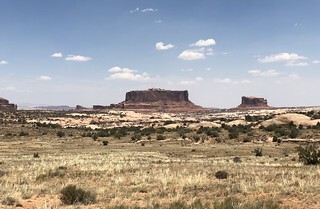 The hoodoos form at the intersection of the Cannonville and Gunsight Butte members of the formation. The upper Cannonville layer has more clay and silt, so it erodes away, leaving pillars of the Gunsight Butte layer. 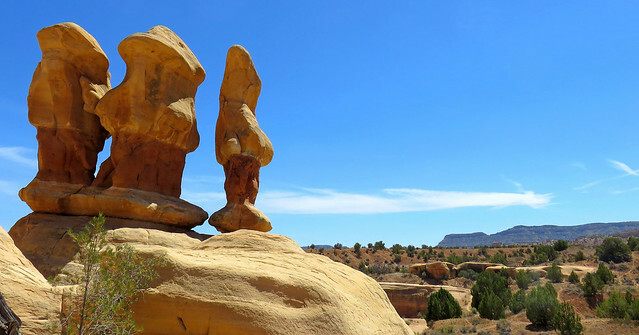 Erosion changes ridges into standalone hoodoos, which are taller than a man. One group reminded me of Disney’s Snow White and the Seven Dwarfs, standing high on the rocks over a dry gully. There were a few other visitors wandering amidst the rocks and admiring the thin and thick arches. No doubt we were all glad to be afoot after enduring the bone-rattling ride to get there. 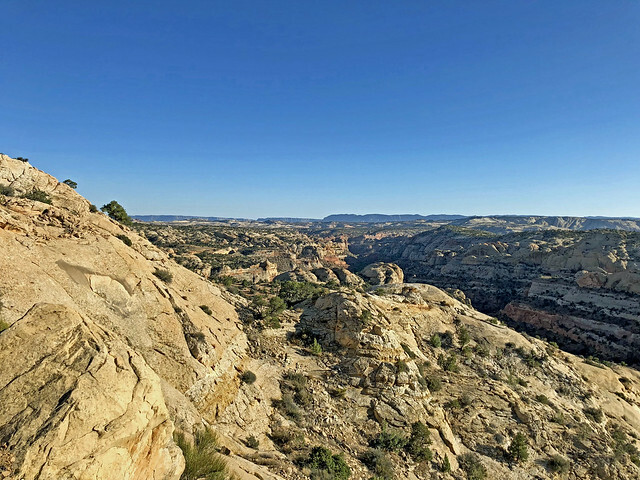 We were not tempted to continue down Hole in the Rock Road to its canyons, instead struggling back north along the 12 miles of rough road to Escalante. Along the way I pondered how the road gets even rougher if you turn south for the 50-mile journey that ends in the Hole in the Rock itself at Lake Powell. 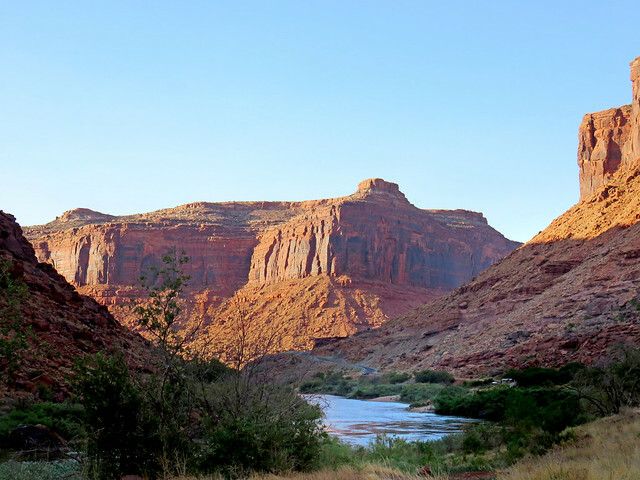 In 1880, an expedition of Mormons trying to settle in southeastern Utah widened that narrow crack in the canyon rim above the Colorado River to reach a ford. The drop to the river was nearly 2000 feet with an average grade of 25 degrees, although some places were as steep as 45 degrees. Construction of this passageway was very difficult, plagued by lack of wood, forage for cattle, bitter cold, and diminishing food supplies. Blasting powder and picks were used to widen and/or fill various sections of the crevice. At the lower part of the Hole, a road was constructed on the side of a sheer cliff wall. Although a three-foot shelf had already existed, an extension to the shelf was formed by driving two-foot stakes into the rock and piling vegetation and rocks on top. 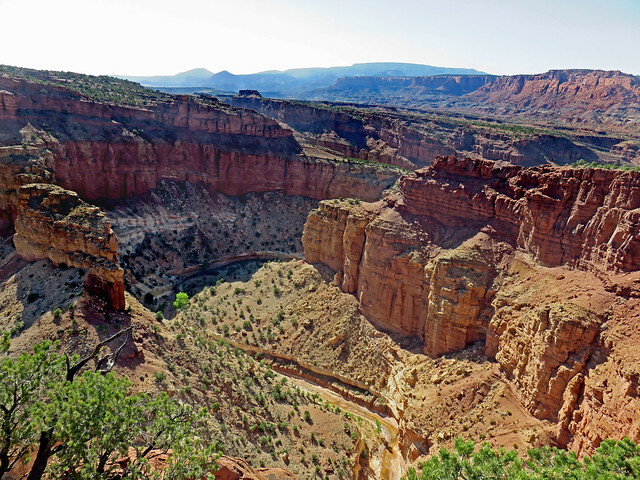 This portion of the trail was nicknamed “Uncle Ben’s Dugway” in honor of its engineer, Benjamin Perkins. After six weeks of picking, chiseling, drilling, blasting, and digging, the Hole-in-the-Rock road had been completed. Even after they finally crossed the Colorado, the pioneers had another 120 miles of arduous travel before they reached Bluff, Utah. 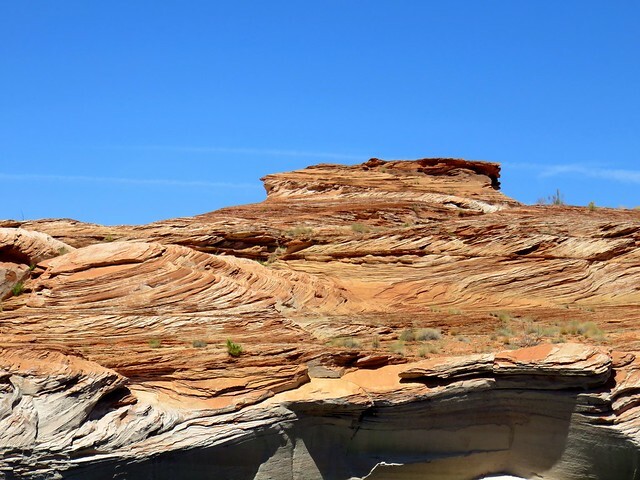 One-third of the Hole in the Rock slit now lies beneath the waters of Lake Powell. The Hole was only used for a year before the settlers shifted the route a few miles over to the better Hall’s Crossing. The incredibly rough “modern” Hole in the Rock Road to the area is one of the most traveled in the monument, but is still hellish despite being graded 20 or more times each tourist season. The terrain in this region is unforgiving. Later in the week Wendy and I would take the modern route 191 through Bluff as we traveled from Page, Arizona to Moab, Utah. 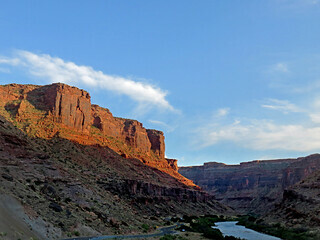 The modern roads make long sweeping arcs to avoid the rough mesas and canyons on either side of the Colorado River. Upon returning to Escalante, we purchased the most normal food we could find at a hipster grocery. We had already sampled the two major restaurants in town. We had a kindly server at the Circle D while the best thing about Boots Cafe was its large taxidermied bear. This was the most remote area we visited during our vacation. The lack of services and sparse population allowed me to fully relax, knowing that I was truly away from work. Both Wendy and I preferred to avoid the crowds by shunning the pay areas of the multiple national parks along our route. 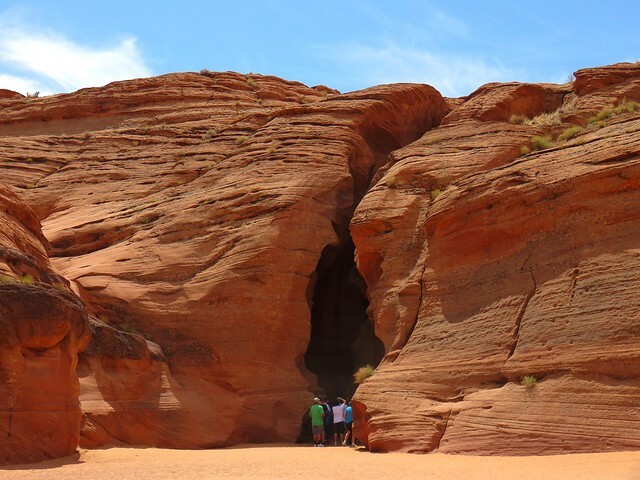 The next phase of our trip would take us past Bryce Canyon down to Lake Powell in Arizona, where we would take a sunny boat tour and a shaded guided walk through a picturesque slot canyon. Giving up a lifetime of summer breaks was part of the package when I became a 12-month school district administrator. But Wendy is still a classroom teacher with summer breaks, so when I mapped out my use of my limited vacation days beginning in July 2017, I made sure to save back enough for a 9-day June vacation for the two of us. In July 2017 we had driven out to the Grand Canyon in Arizona with friends, and Wendy had wanted to visit a slot canyon at the north edge of the state. But our itinerary that year could not accommodate that addition. 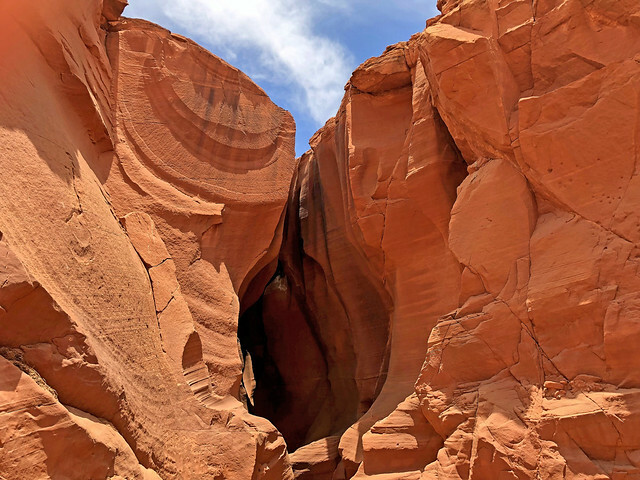 So when she again mentioned wanting to see a slot canyon in northern Arizona, following that up by sharing with me online photos of beautiful scenery in southern Utah, I formed a plan. 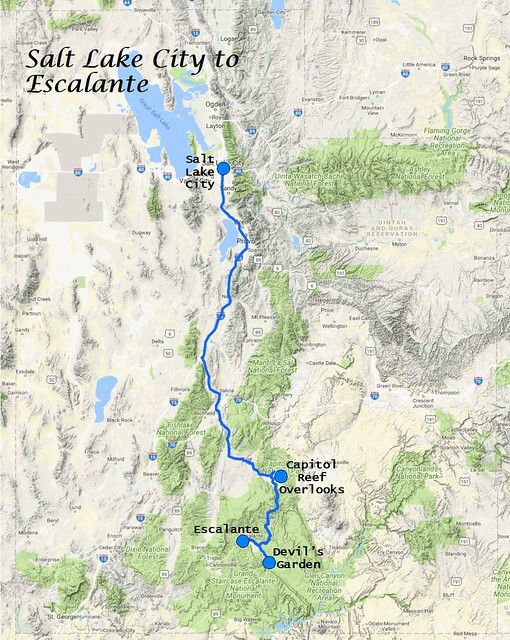 Neither of us had spent any time in Utah, so we would fly out to Salt Lake City and loop our way south to Escalante, lowering the lasso enough to later reach Lake Powell and Antelope Canyon before heading back up and over to Moab as our last stop before returning to Salt Lake to fly home. When I rented a car for our honeymoon a couple of years back, Hertz had failed to honor my prearranged discount. So for our long drives through Utah I was determined to work with a different rental company. I ended up with a good deal from Thrifty, which they fully honored. We did have a long wait at the rental car counter at the Salt Lake City airport on a Thursday night. We were fourth in line with only one agent, and the couple just ahead of us, who took turns chasing down their wandering toddler, kept having their credit card declined. We didn’t run into that trouble, although that prompted me to file a travel alert with my bank, something Wendy had already done for her own card. Overall, it took over a half hour for us to finally secure a Ford Fusion Hybrid. 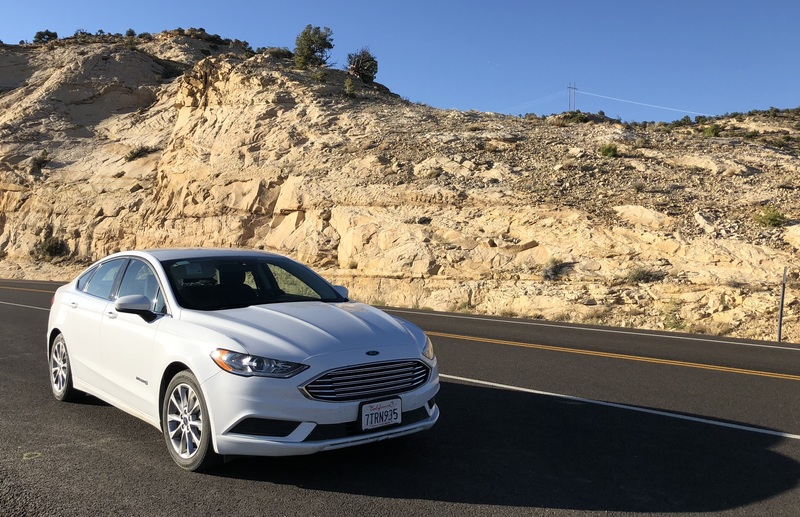 I’d never driven a gas-electric hybrid vehicle, so it took me awhile to become accustomed to our second-generation Ford Fusion. I loved its 45+ miles per gallon efficiency, but the large battery reduced the trunk space so much that our largest piece of luggage had to be transported in the back seat. The car was also more sluggish than what I am accustomed to, meaning I had to be cautious about passing other cars on two-lane highways. I did enjoy its coaching on my acceleration and use of the car’s regenerative braking, which helped me increase its efficiency. Years back I read Jon Krakauer’s well-written Under the Banner of Heaven: The Story of a Violent Faith, which told early stories of the Latter Day Saints and their Mormon theology. So I knew about Brigham Young leading the largest sect westward to settle at the Great Salt Lake. I presume many of the folks we met throughout Utah were Mormons, given they comprise 63% of the state’s population. Wendy and I were both struck by how most of the tourists we saw were Asian, followed by a formidable showing of Germans, with a few Australians and Brits in the mix. Salt Lake City appears to sit in a bowl with the Wasatch Range to the east and north and Oquirrh Mountains to the west. When I first saw the latter name on a terrain model at the Utah Museum of Natural History, I had no idea how to pronounce it. Only later did I find out you say it as you would “oaker”. 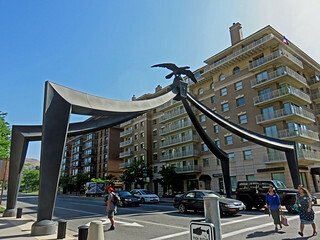 Our coolest weather of the trip was in the city, with us staying at a Holiday Inn Express near Temple Square downtown. Around us were many hipster bars, something that surprised me, given the Mormon prohibition on alcohol. Some research, however, revealed that only half of the city’s residents are members of that faith. I did not care for most of the hotel’s decor. It was mid-century modern revival, with an uncomfortable low-back couch and hard chaise longue (that’s the French spelling). Our suite was spacious, but the large kitchen area had a dozen or more empty cabinets, and the living room needed a coffee table. Wendy compensated with our usual travel trick of turning an adjustable ironing board into a narrow low table. 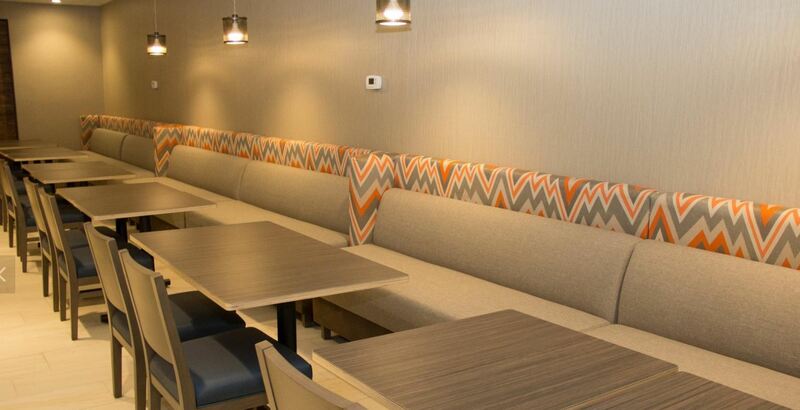 Wendy, however, admired the gray and orange color combination in the seat backs of the hotel breakfast area, which was spacious and had a separate food area offering hot items such as crispy bacon, scrambled eggs, mini omelets, and good cinnamon rolls. We set off the first morning to walk the few blocks over to the 10-acre Temple Square. 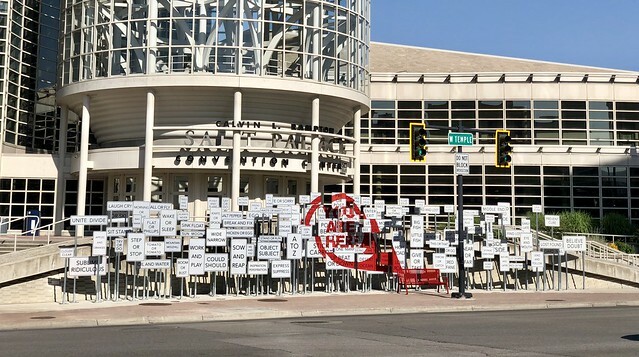 We passed a passel of signs out in front of the convention center. 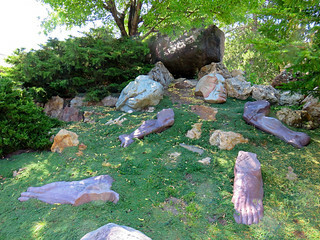 They were an art installation called Point of View designed by Maine artist Aaron T. Stephan. Wendy and I both were prompted to think of Signs by Five Man Electrical Band. The “You are here” element when you face the installation head on is a nice added touch. The Temple Square is surrounded by a 15-foot high wall. Within the grounds is the imposing 222-foot high quartz monzonite temple, built from 1853-1893, as noted by a large panel on its eastern face. We could not venture inside, something reserved for Mormons who are baptized and receive a temple recommend after multiple interviews. A 12-foot tall golden statue of the Angel Moroni adorns the tallest spire. 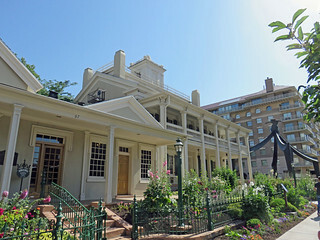 The entire Temple Square features well-tended flowerbeds and plantings. We viewed the temple from the south and northeast, as well as facing head-on toward its eastern façade. While Young’s dreams of a State of Deseret did not come to pass, the Compromise of 1850 brought Utah territory, which became a state in 1896 after a ban on polygamy was adopted by the church in 1890, with the prohibition incorporated into the state constitution. At the Eagle Gate next to the Beehive House we turned back to return to our hotel. I will confess I dislike the 1960s mid-century modern version of the gate, even more than the hotel’s decor. I realize the historic versions of the gate were made obsolete by street widening, but their more conventional pillars seem far less threatening than the current arachnoid creation. More to my liking was part of Dennis Smith’s Counterpoint bronze figure set, with a mother twirling her daughter about in the air. We later drove due east to what I thought of as University Hill, where the University of Utah is draped across the lowest slopes of Mount Van Cott. 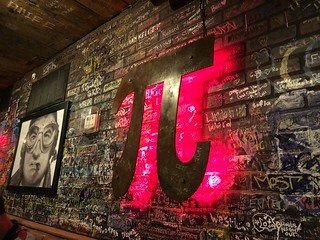 We ate lunch at The Pie Pizzeria‘s underground location, where legions of university students had scribbled their graffiti across every wall. 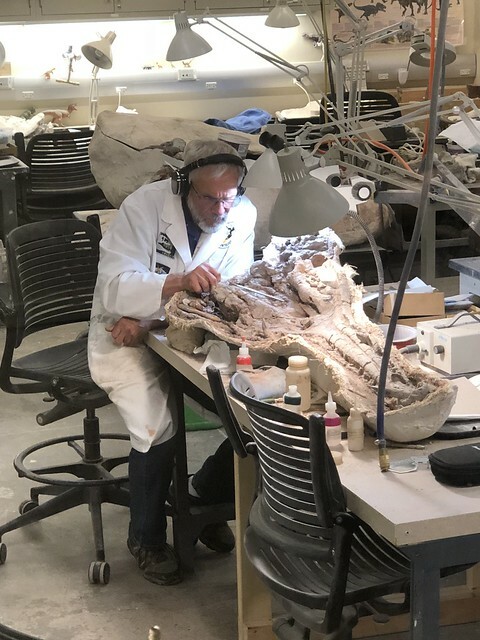 Nearby was the Natural History Museum of Utah, filled with skeletons of dinosaurs and other ancient life, along with many quite lively young humans. It was fun to see workers picking away at fossils, including the skull and lower jaw of a Teratophoneus curriei. Wendy loved the wall displays of gems and minerals. I enjoyed the panorama from the upper deck of the museum. We also ventured to the Utah Museum of Fine Arts. 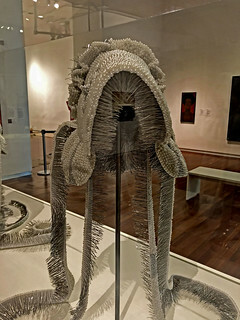 Angela Ellsworth’s Seer Bonnet made me uncomfortable with its thousands of pearl-tipped steel corsage pins creating a beautiful exterior but sharp and dangerous interior. In Ellsworth’s reimagined history, Joseph Smith received prophetic powers via a seer stone while his multiple wives received their own visionary and revelatory powers from their seer bonnets. When I was a little boy my tiny maternal grandmother, who had a hardscrabble garden in Paoli, Oklahoma, used to have me wear a bonnet while I hoed weeds. I am most grateful she did not have me wear a seer bonnet! 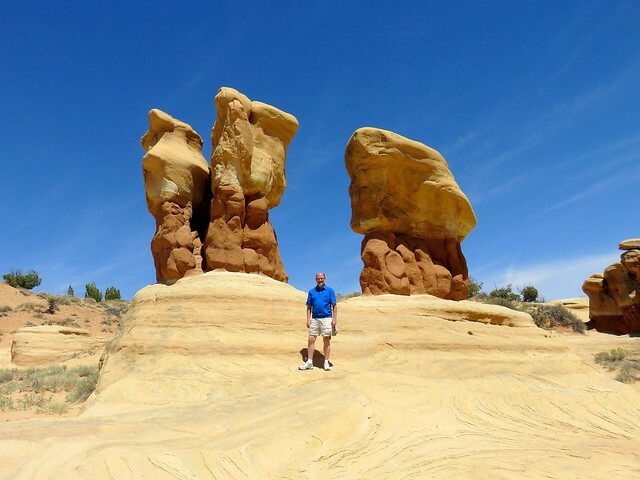 A stop on the morning we left town to head south to Escalante was the Gilgal Garden. 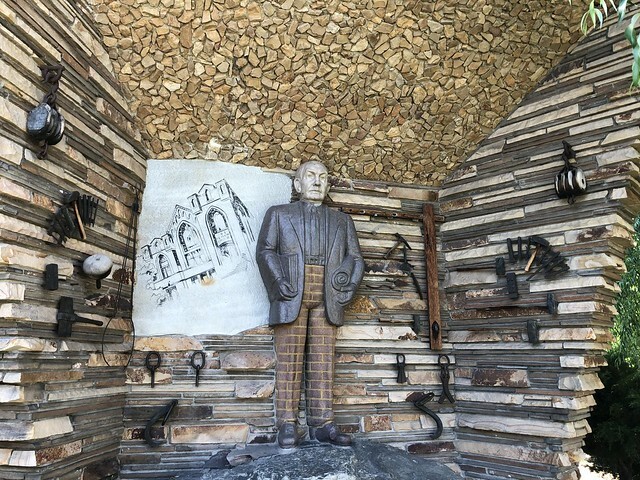 From 1947 to 1963, Thomas Battersby Child, Jr. filled his backyard with 12 bizarre sculptures and over 70 stones engraved with scriptures, poems, and literary texts. 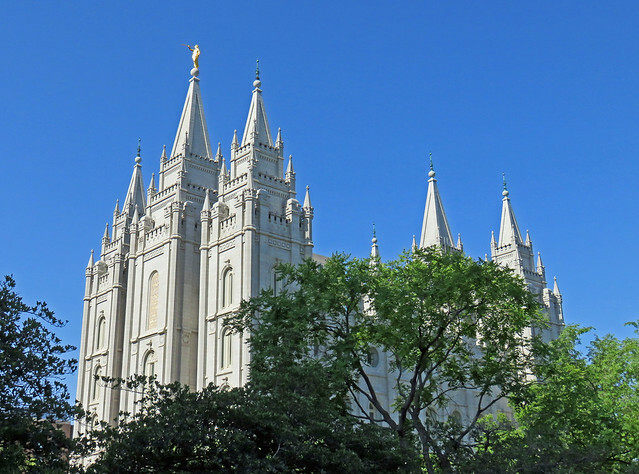 Child was a masonry contractor and a Bishop of a Salt Lake ward of the Latter-Day Saints. In the Bible, Gilgal was the camp where Joshua ordered the Israelites to place twelve stones, one for each tribe, as a memorial after they crossed the Jordan River. Child identified large stones which he had transported to his garden to be sculpted, adapting an oxyacetylene torch normally used for welding into a tool for reshaping stone. He hired artist Maurice Edmunds Brooks to assist with the project, fashioning a sphinx with the head of Joseph Smith, an offputting shrine to Child’s wife Bertha, and other tableau, including a full-size standing sculpture of Child himself with symbols of his ward and his trade, including brick pants. “Priesthood” includes a rock arch formation with a keystone with letters Alpha and Omega on it, which are symbolic of Christ’s words: I am the beginning and the end. The granite boulders are for recorded messengers who helped restore the Gospel to the earth, such as Peter, James, John, Elijah and Moses. Cast books include The Book of Mormon, Doctrine and Covenants, and Pearl of Great Price. A cave featured two human hearts, one red to symbolize life and the other white for death, with two hands descending like stalactites. This symbolizes the baptism of the dead, one of the more controversial practices of the church, which is why it invests heavily in genealogical research and records. A hillside with giant dismembered body parts called “Daniel II” depicts King Nebuchadnezzar’s dream of a large giant emerging from a mountain, topped by a boulder, which comes down to destroy him. It symbolizes the end of all man made kingdoms. The engraved figure of a man holding an unsheathed sword, with a huge boulder in place of his head, is part of the Gilgal tableau. That could be symbolic of the Gibeath Haaraloth (Givat Ha’aralot): the hill of foreskins where all of the Israelites born during the Exodus were circumcised. Enough said, eh? The most striking sculpture to me was an old man’s head on the ground near a huge grasshopper, with a nearby well missing its wheel and a broken pitcher. The symbolism is from Ecclesiastes 12:5 and 12:6. Child recognized that his art was eccentric, stating, “You don’t have to agree with me. You may think I am a nut, but I hope I have aroused your thinking and curiosity.” He certainly succeeded, with me pondering his works 55 years after his demise. Next door a large condominium complex was under construction on the sites of former residences. 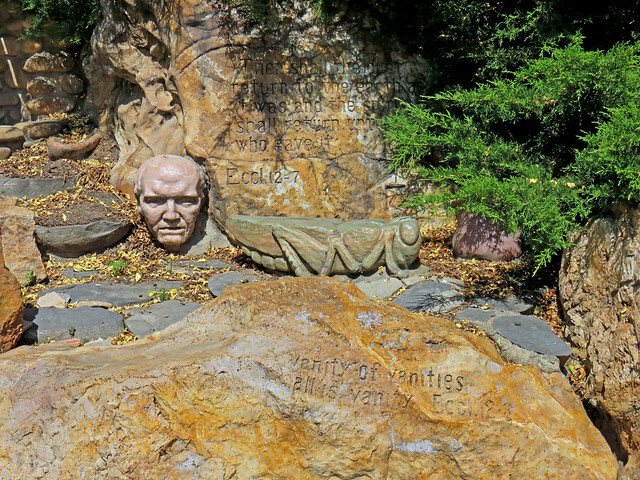 The Gilgal Garden was threatened with the same fate in 2000, only spared from development by a $679,000 investment by the county and various donors. 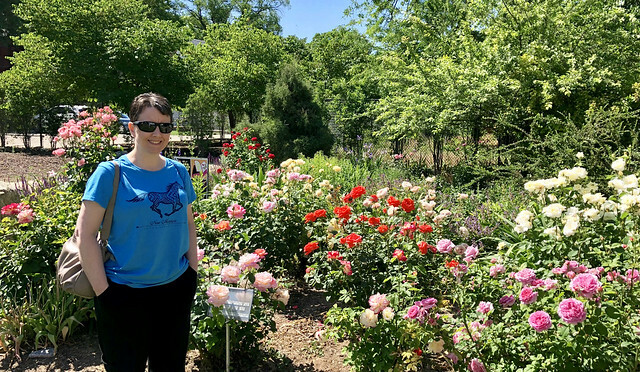 Volunteers and nonprofits have rejuvenated the property, repairing vandalized pieces and planting the garden with many beautiful roses and other plants. Wendy was delighted with the rose beds and how the gardeners had labeled the various hybrid teas on display. Salt Lake City is part of the Wasatch Front, a long metropolitan area stretched out along the western side of the Wasatch Range of mountains where 85% of the population of Utah resides. South of there is Provo, known to me as the home of Brigham Young University (BYU) and the birthplace of the WordPerfect software I relied on for over 30 years. I first learned to use WordPerfect at the University of Oklahoma in 1985 and always found it superior to Microsoft Word. While I no longer use WordPerfect itself, I still regularly use the vector drawing portion of the Corel Presentations software which was born from it. Over the decades I had many superb students who were Mormons. They often chose to receive their higher education at BYU. So I thought it would be interesting to finally glimpse its campus. Our journey south to Escalante included zooming down the massive Interstate 15 past Provo, so we turned off there to visit the art museum on the campus. I liked the directive at the campus entrance: “Enter to learn; go forth to serve“. 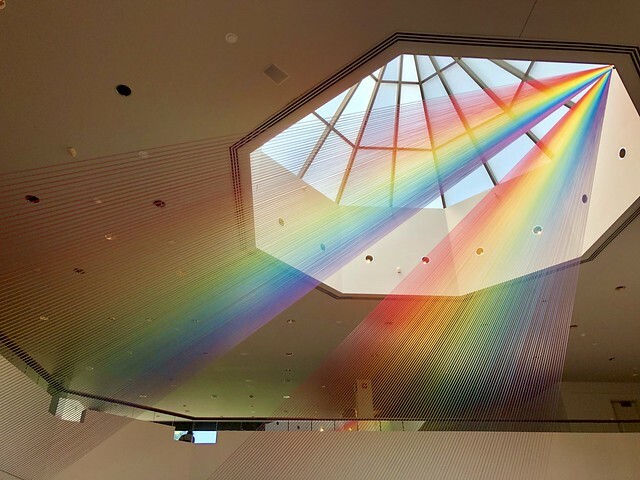 The nearby art museum had a striking piece, Gabriel Dawe’s Plexus no. 29, consisting of almost 80 miles of colored filament threaded between the Museum’s mezzanine walls and oculus. I presume the symbolism of the flood would occur to many believers, although I found the display somewhat incongruous given the modern association of the rainbow with the gay pride movement and the Latter-Day Saints’ condemnation of homosexual behavior. 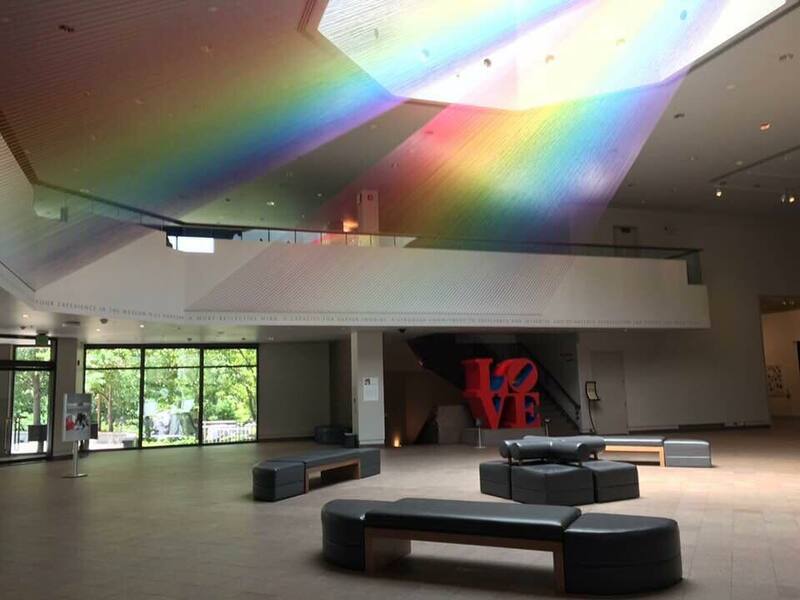 Wendy’s shot showing one of Robert Indiana’s Love sculptures under the rainbow only reinforces my bemusement. I was hoping to see what was described by previous tourists as a nice Escher exhibit, but that was closed. Wendy and I were more than adequately compensated, however, by the inventive, funny, and varied works by Nina Katchadourian on display. Her Lavatory Self-Portraits in the Flemish Style were quite hilarious. Beginning in 2010, Nina started taking photographs and shooting videos in airplane lavatories, with tissue paper toilet covers and the like adorning her head in the style of 15th-century Flemish portraiture. We could put on headphones and watch her lip-syncing to various songs by groups one definitely does not associate with 15th-century Flemish art. I liked her Songs of the Island: Concrete Music from New York, in which she collected bits of discarded unraveled cassette tapes found in the gutters of the Big Apple, cleaned them up, and spliced them together into a mix tape that is both a wall art installation that shows where she found them and an audio experience in which you can hear the bits of reggae, salsa, Indian pop, punk, rhythm and blues, country-rock, old-school rap, metal, and Vietnamese music she found on them. Her delightful The Geneaology of the Supermarket was a huge wall covered by a family tree of fictitious and fanciful relations among various grocery advertising characters. She adds local images to each installation of this piece, so it is alive and growing. Wendy and I guffawed at discovering how Uncle Ben and Aunt Jemima were siblings, the Green Giant and the Land o’ Lakes Butter Maiden were married and the parents of the Argo Corn Starch maiden, and Mr. Clean and the Brawny paper towel guy got married and adopted the Gerber Baby and the Sunbeam Bread girl. Clearly the Mormons at BYU do have a healthy sense of humor. Did you know that the Green Giant and Land o’ Lakes Butter Maiden were the parents of the Argo Corn Starch maiden? At the museum I also admired the far more traditional, and quite beautiful, Le Premier Chagrin (The First Grief) by Daniel Ridgway Knight. 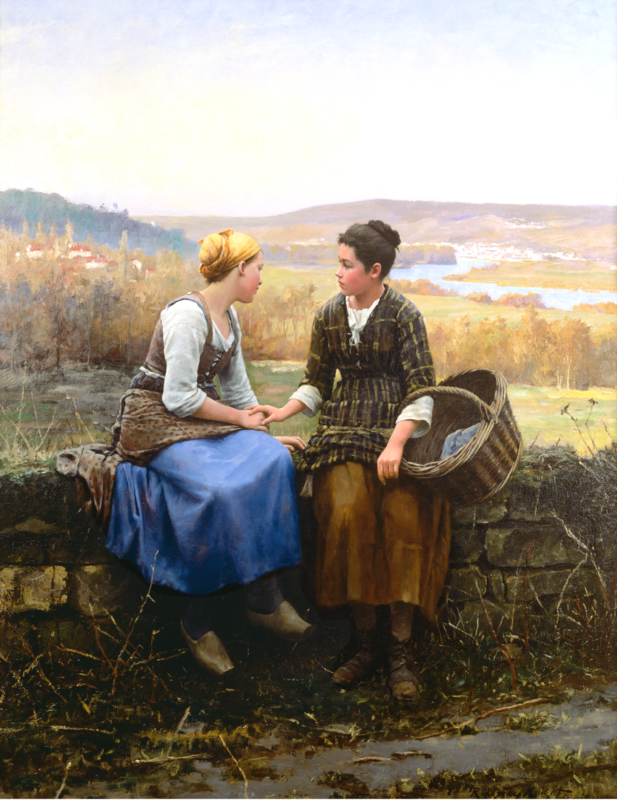 This lovely painting of two French peasant girls was crafted in 1892. Wendy was kind enough to locate a print of it in the art museum’s gift shop for me. 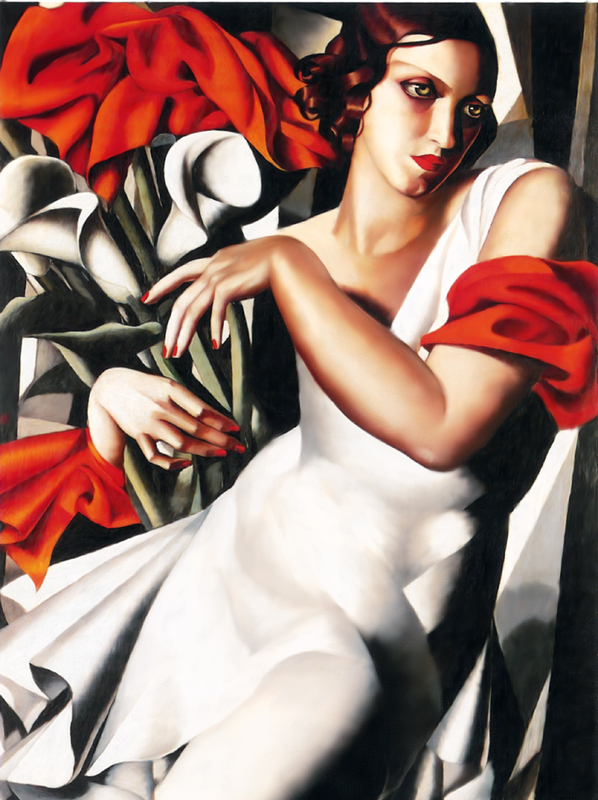 It now adorns a wall in my man cave at Meador Manor, across from Tamara de Lempicka’s Portrait d’Ira Perot. The digital version below does not do it justice, but provides a facsimile of its touching beauty. Eager for lunch, we asked girls working at the museum for a recommendation. That led us to CHOM burgers, where the food was quite tasty even if owner Colton Soelberg admits that “Chom” itself has no meaning at all. 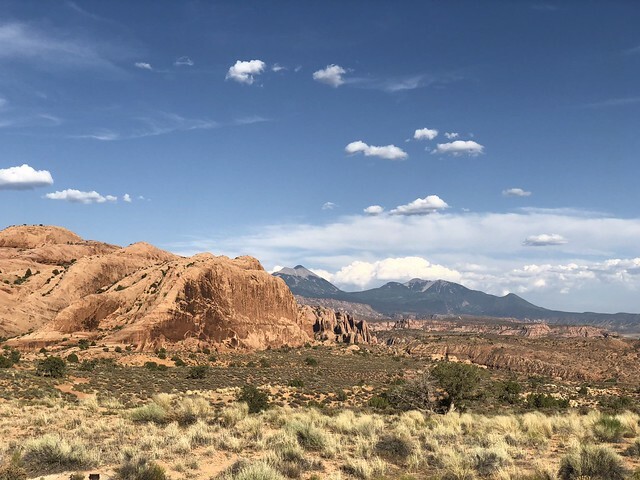 That concluded our adventures in the metro area, with us heading south for the scenery of the tip of Capitol Reef National Park and the Grand Staircase-Escalante National Monument, which we will share in the next post about our Arid Adventures in Utah and Arizona. In one of those dreams that returns from time to time, I wander through what is purportedly my house, discovering levels and wings that I either had forgotten about or long neglected. It is somewhat disappointing to awaken and realize there are no forgotten rooms to be remembered or revisited. and attacked the ocean bed. Yes, those are the third and fourth verses of Procol Harum’s Whiter Shade of Pale that were not part of the official recording yet vibrate the air at some of their live performances. I am interested in how one can, as the above video does, use the entirety of the song to form a somewhat more coherent narrative than with its popular truncated version. However, I still regard the song’s nautical references more as metaphors about a negotiation that ends in a sexual act than being about a man and woman on a ship. Of course that is about the flag above Fort McHenry, for that is the second verse of our national anthem, with two more to boot which most of us would struggle to recite, let alone sing to the old drinking song Anacreon in Heaven. This sort of thing reminds me of church hymnals with their plenitude of forgotten verses. 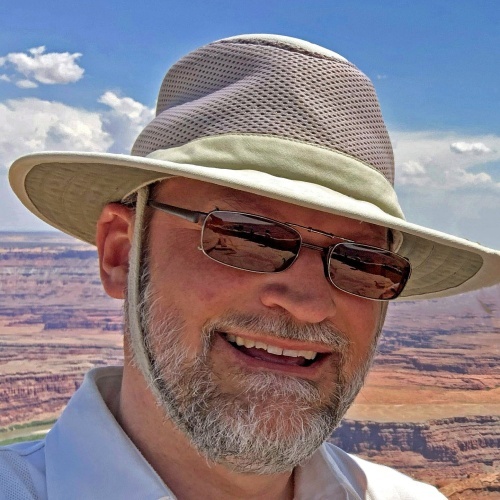 As a youth, I was always intrigued when Charles Mohr, the choir director at Western Oaks Christian Church in far west Oklahoma City, would have the congregation sing some of the forgotten verses of popular hymns. Just as I Am from 1835 has seven verses, but how many times have all seven been sung? Alan Jackson selected verses 1, 3, 4, and 5 for his rendition, as did Tennesee Ernie Ford. That seventh verse is often omitted, as the first six appeared as a poem in 1835 and the seventh came a year later, but from the same author, Charlotte Eliot. The middle lines of the verse rescued you, I trust. That is the fourth verse of Jingle Bells, although I reckon you might, like me, only truly know the first verse with perhaps a dim recollection of the occasional Fannie Bright enlivening the Christmas season. I notice that in many versions they don’t add the “Ha ha ha” I learned to insert after “laughing all the way”. I do find these variations fun…or should I say joyful? But why did it have to be me? Yes, they completely rewrote the lyrics during the song’s development and gave it a weird Fats Domino vibe for the released version on the album. I started this post remarking on my dreams of lost rooms. But dreams can sometimes turn into nightmares. There is a forgotten verse of Big Rock Candy Mountain or Hobo’s Paradise that, once you hear it, will change your understanding of the song. Oh, dear. Perhaps some forgotten rooms are best left unexplored. But don’t let the occasional odd turns stop you, for there is much delight to be found in the variations of verse and song.